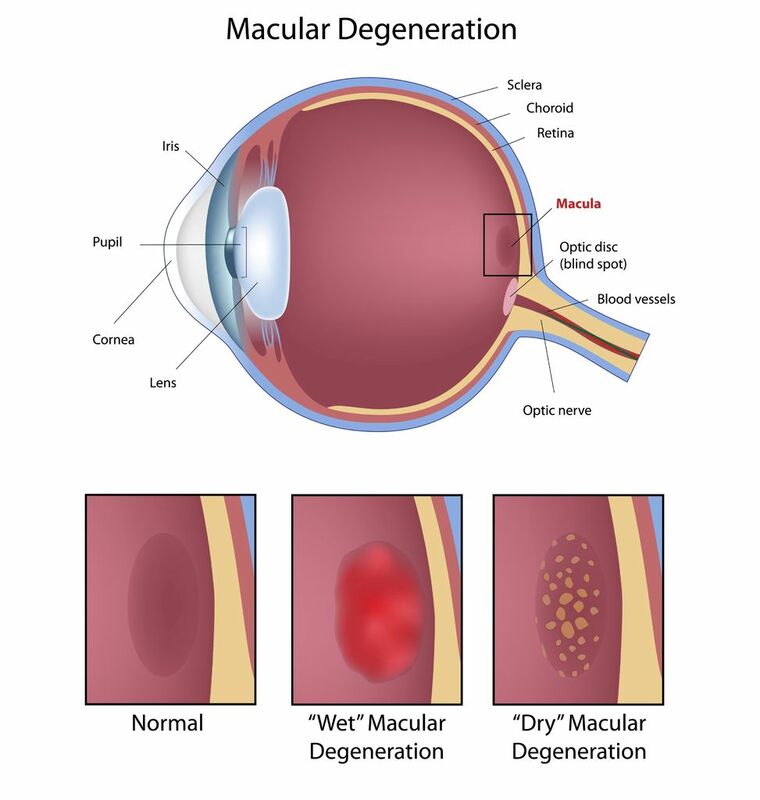 Age-Related Macular Degeneration (AMD) is a retinal eye disease that causes progressive loss of central vision, but leaves the peripheral vision intact. This progressive degeneration affects the macula, which is responsible for fine detail and color. This can make it difficult to read, drive, write, recognize faces, or perform daily tasks. AMD can be divided into two general types: Dry (Atrophic) and Wet (Oxidative). The "dry" form of AMD results from a slow wearing away of the layers of the macula, and occurs over many years. As dry AMD progresses, you may notice a central blurring in your vision. The "wet" form of AMD is due to leakage of blood or fluid from an abnormal blood vessel that grows in the macula. This can lead to sudden distortion or loss of central vision in a short period of time. Wet AMD is responsible for the majority of cases of severe vision loss in AMD. The risk of AMD increases as a person gets older. Other AMD risks include smoking, gender (females more likely to get AMD than males), and cholesterol. People with a family history of AMD may be at higher risk of getting AMD. Much recent research has been done regarding treatment options for wet AMD, and these studies have revealed that Lucentis has been the most effective and beneficial treatment. Lucentis has been proven to prevent vision from getting worse and a small percentage of Lucentis patients noted an improvement in their vision. However, not everyone is a candidate for Lucentis. There are other treatments available. Your ophthalmologist will provide a treatment plan that best works for your eyes.